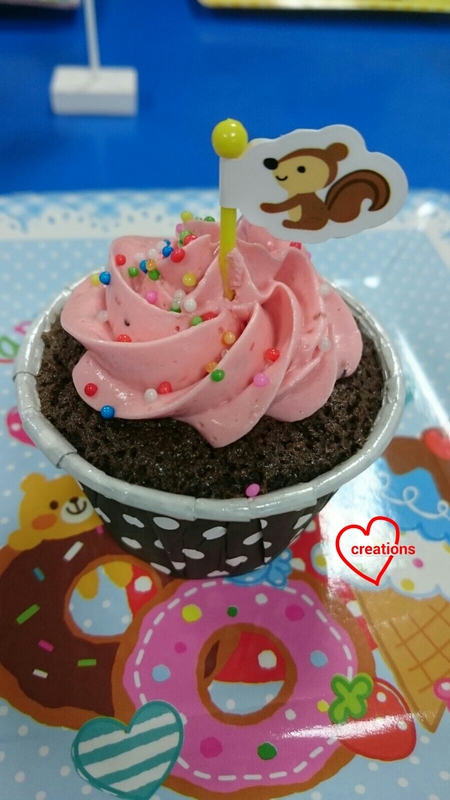 I have a Japanese mummy friend who wanted to order some cupcakes for her younger boy's birthday during a very busy period for me. She didn't mind it being a simple bake as long as it is yummy. Here's a humble bake from me. 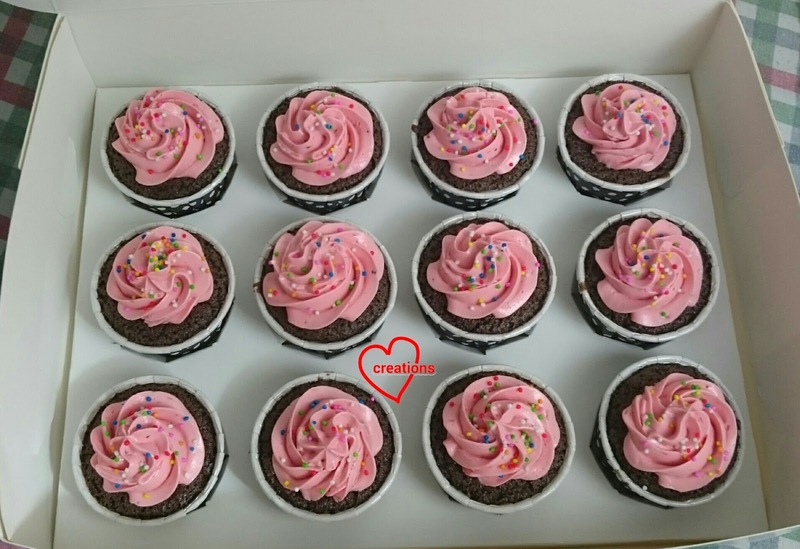 Chocolate chiffon cupcakes with strawberry swiss meringue buttercream and rainbow sprinkles :). I used my chocolate log cake recipe that was very well received for the chocolate cupcake base. 1. Preheat oven to 140°C with tray of water at base of oven (optional but I put it there to create steam). Set oven rack to second lowest position. 2. Prepare egg yolk batter. Whisk egg yolks and sugar until thick and pale. Add oil and whisk until well combined. 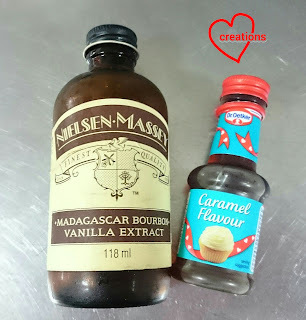 Add milk, vanilla and Kirsch. Whisk until well combined. 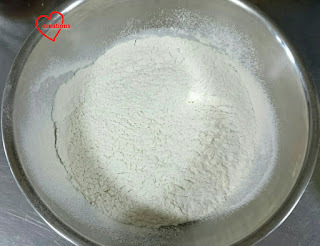 Gradually sift in flour, cocoa powder, salt and baking powder. 3. 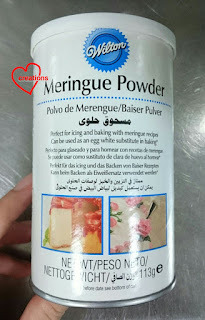 Prepare meringue. In a clean metal bowl, use electric mixer to beat egg whites with cream of tartar until foamy. Gradually add sugar and beat until firm peaks form, just before stiff peaks. 4. Fold the meringue into the egg yolk batter quickly but gently in three additions. Spoon the batter into cupcake cases until about 1cm from the top of the rim. Gently tap the cases on the table to release air bubbles. 5. Bake for 30-35 minutes or until skewer comes out clean. Cool completely before frosting the cupcakes. 1. Place egg whites, sugar and salt in a heatproof bowl that can fit over a saucepan filled with about 1" depth of water without the base of bowl touching the water. 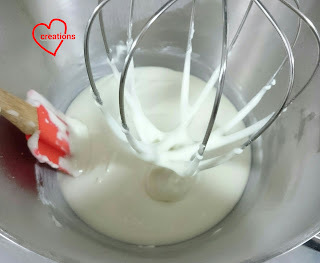 Use a hand whisk to whisk the egg whites continuously over simmering water in the saucepan until sugar has dissolved and temperature reaches 71.1°C on a candy thermometer. This takes about 5 minutes. 2. Remove the bowl from heat. 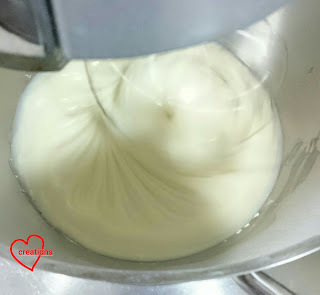 Use an electric mixer to beat the egg whites on high speed for 10 minutes until the meringue is stiff, glossy and cool to almost room temperature. 3. Add butter once cube at a time and beat until smooth. Don't worry if the buttercream appears to curdle halfway. Just continue to beat and gradually add butter and it will all come together in the end. Continue beating for another two minutes after all butter has been added until the cream appears light coloured and fluffy. 4. Gradually add strawberry puree and beat until well combined. 5. Add strawberry paste and beat until well combined. Transfer buttercream into piping bag fitted with a Wilton 1M tip and pipe swirls on the cupcakes. 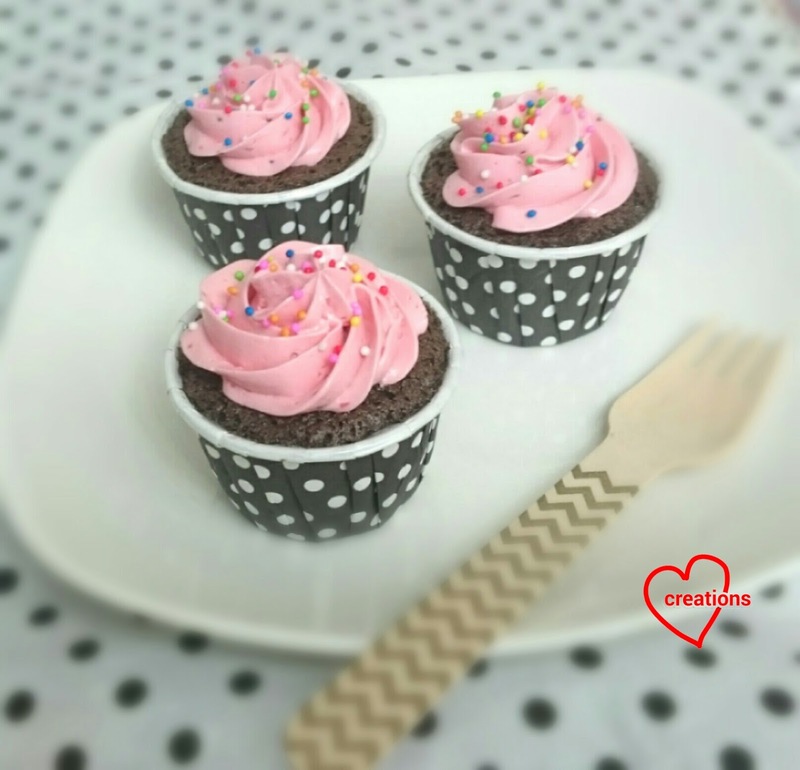 Sprinkle on some rainbow sprinkles and store the cupcakes in airtight condition in the fridge. It can store for 3-4 days. 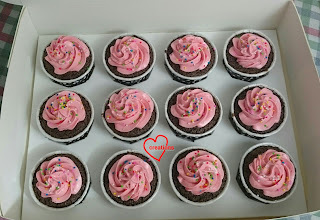 She fedback that everyone said the cupcakes were really yummy! I tried dressing up some Peanut Butter Chiffon Cakes as mooncakes as gifts for Teacher's day (this is a trial). Mid-autumn was coming but I didn’t have time to go baking shops yet to buy the ingredients, so that gave me an idea to dress up my chiffon cakes into mooncakes (will still be making the real ones soon because I finally got the ingredients today!). 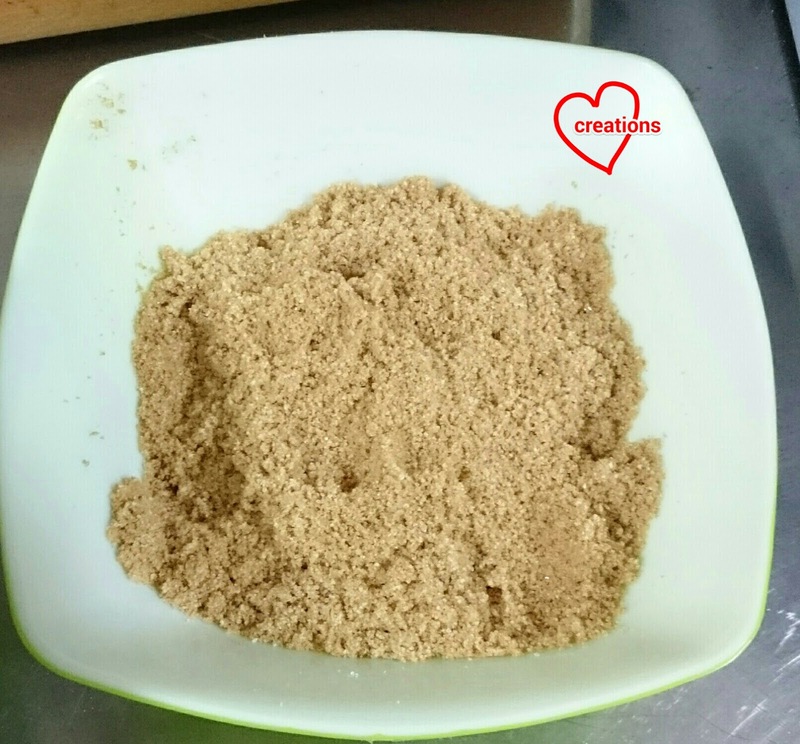 Peanut butter is a very nice and yummy flavour that comes strongly in chiffon cakes. If you loved the kaya, you may like this one! I wrapped the peanut butter chiffon cake with strawberry jam-flavoured chiffon sheet cakes. This was another experiment. 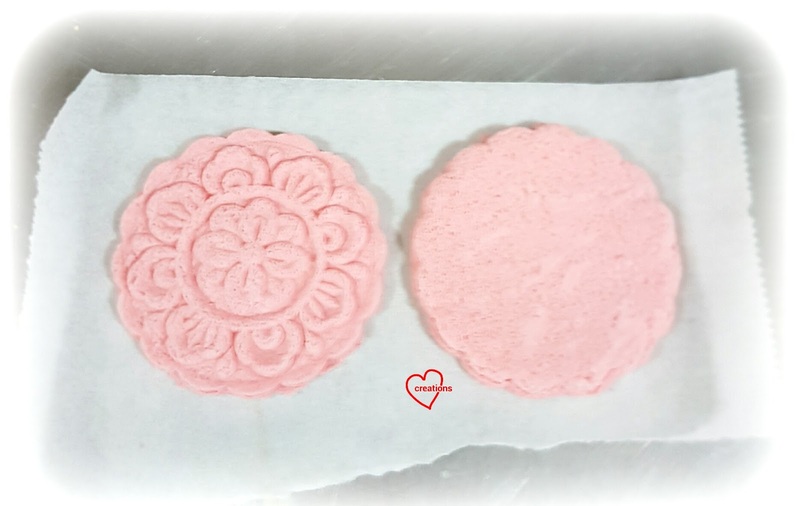 I observed that the mooncake plunger looks very much like our cookie cutter plungers, so that gave me the idea to try using it as a cutter for my sheet cakes, and it worked like a charm! 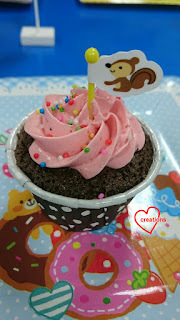 The patterns on the plunger was also transferred onto the sheet cakes! =) Presenting my Peanut butter and jam Mooncake Chiffon Cakes! 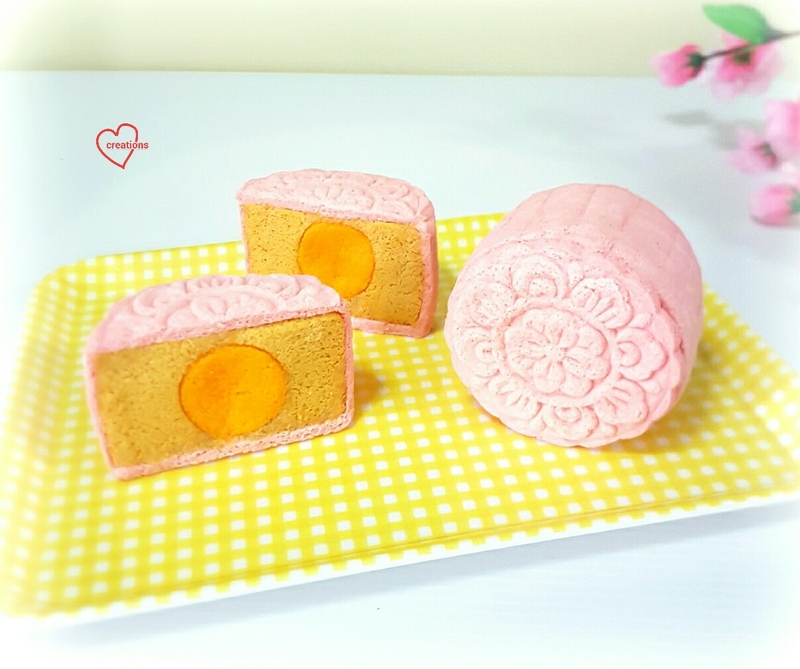 Each ‘mooncake’ is a 4-inch peanut butter chiffon cake, wrapped in strawberry jam-flavoured chiffon sheet cakes. 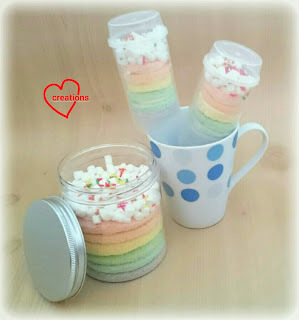 I have also written the recipe for one 7-inch chiffon tube pan in case you just want to try the yummy flavour! 1. Preheat oven to 160°C. *Optional: I used steam baking, i.e. I placed a pan of water under the lowest rack before preheating – to control oven temperature, prevent cracks and for moister texture. 2. Whisk egg yolks with sugar until light, fluffy and well-mixed. 3. Add in oil, then water or milk and mix well. Add in peanut butter and whisk till well-combined. 4. 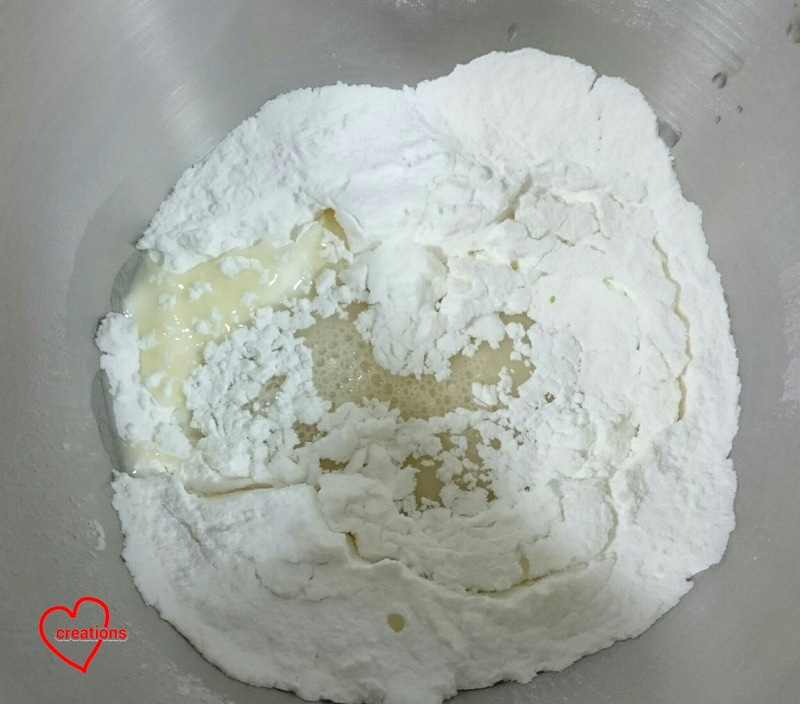 Whisk in sifted cake flour, baking soda, baking powder, a pinch of salt and mix till well-combined. 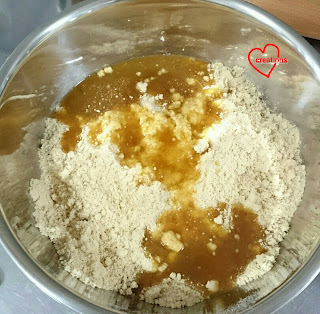 *Optional: Spoon out 3 tsp batter and add extra 5g peanut butter for darker coloured batter (for making the ‘egg yolk’) – optional if you don’t want to make the ‘egg yolk’. c. Add in rest of the castor sugar for meringue and whisk till firm peaks form, or just the point of stiff peak. Firm peaks give finer, softer texture. 6. Gently fold in meringue gently into peanut butter batter 1/3 at a time. *Optional: Transfer 6 tbsp meringue into the darker peanut butter batter for making the ‘egg yolk’, and gently fold in the meringue into the respective batters in 2-3 additions. 7. Pour into 3 ungreased 4-inch chiffon tube pan (or one ungreased 7-inch tube pan). Gently tap on counter top to remove air bubbles. *Optional: Spoon the darker peanut butter batter into six 3-cm cake pop cavities. Bake for 160°C for 12 min. 8. Bake at 160°C for 15 min, 140°C for 5-10 min for the 4-inch tube pan (or at 160°C for 15 min, 140°C for 30-35 min for the 7-inch tube pan), or until skewer inserted into centre of cake comes out clean. **If you use steam baking, you may need to bake for a few more minutes. 10. Invert pan to cool on a wire rack completely. 11. Unmould the chiffon cakes by hand (see video tutorial ‘Hand unmoulding Chiffon cakes for a clean finishing’). Freshly unmolded Peanut Butter Chiffon Cake - smells good! 3. Add in oil, then water or milk and mix well. Add in strawberry jam and whisk till well-combined. 4. Whisk in sifted cake flour, baking powder, a pinch of salt and mix till well-combined. 6. Gently fold in meringue gently into batter 1/3 at a time. 7. Pour into two 9-inch baking pans, lined with baking paper. Gently tap on counter top to remove air bubbles. 8. Bake at 160°C for 15 min. Peel off baking sheet, transfer onto a new sheet and cover with another sheet to cool completely. 1. Melt some marshmallows by sprinkling some water onto a few marshmallows in a heat-proof bowl, and then popping in into the microwave for 30 s. This makes the ‘glue’ to stick the cakes together. 2. Slice a peanut butter chiffon cake into two. 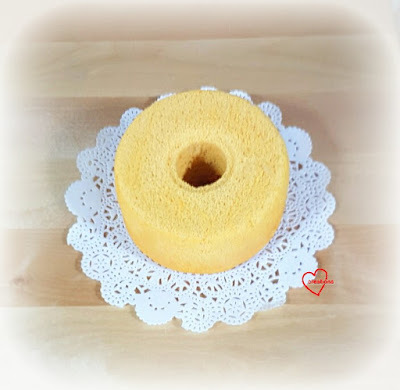 Use a circle cutter to cut out a semi-spherical hole in the peanut butter chiffon cake. 3. Apply some melted marshmallow in the hole and stuff an ‘egg yolk’ cake pop in. Repeat for the other half. 4. 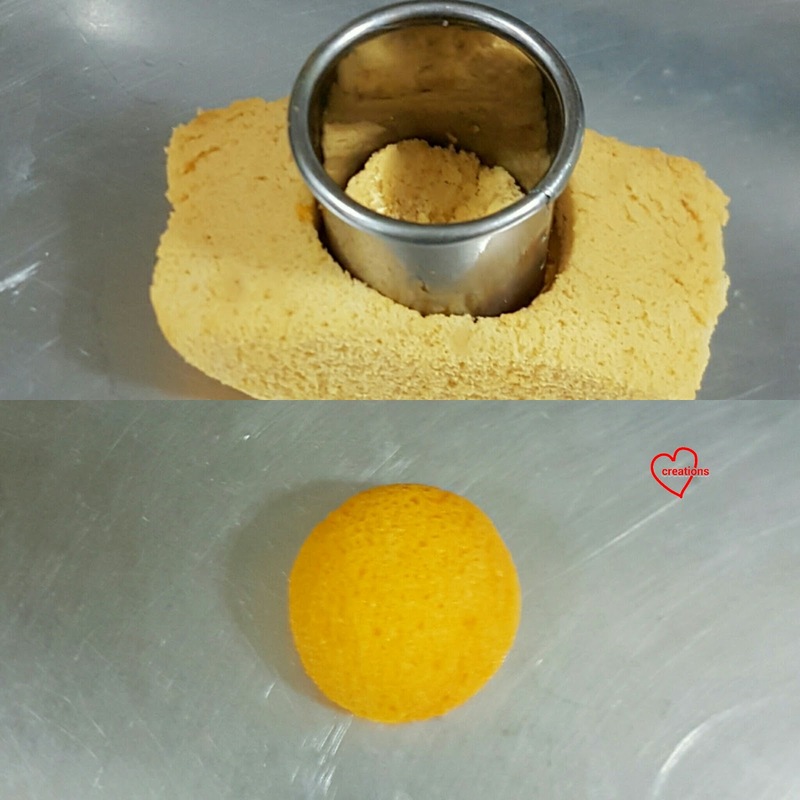 Use a 4-inch mooncake plunger (for 200g mooncake)to cut two pieces from the sheet cakes. For the top piece, push the plunger completely to make the imprints. For the bottom piece, just use it as a cutter (do not push completely down). 5. Cut a strip corresponding to the height of the 4-inch peanut butter chiffon cake (to go around the sides). 6. Use melted marshmallows to stick the pink strawberry jam sheet cakes on the top, bottom and sides of the peanut butter cake. 7. Use a knife to make cuts at the sides of the ‘mooncake’. Hope you will enjoy this labour of love too! Coming to you in mid-Sept! I have been wanting to do an updated brown sugar cookie and royal icing post for the longest time but haven't had the chance or discipline to do so. With this batch of cookies for Teacher's Day and a whooping order of 400 cookies for my cousin's wedding, I thought I would take the time to do a detailed documentation along with some updates from my previous write-up. I will highlight points to note and tips when making these cookies. 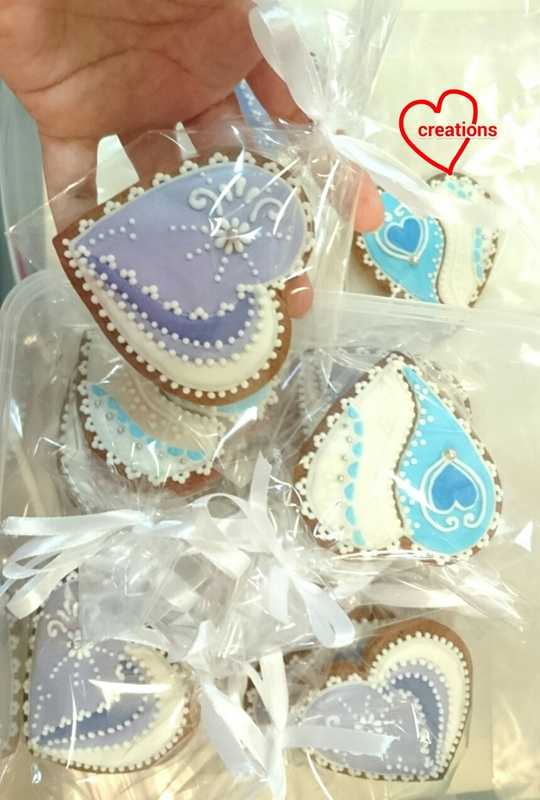 I am really eager to share this because all my recipients have waxed lyrical about the taste and smell of these cookies, with customers coming back for more and learning their lesson to reserve some for themselves before giving away to guests because it's so good. I prefer brown sugar cookies as cookie base over regular sugar cookies that everyone else uses for iced cookies for precisely this reason. The taste is really good. From a baker's point of view, I love the fact that these cookies have a long shelf life (about 1.5-2 months) at cool room temperature, are forgiving so even new bakers are able to master it, and have a soft chewy texture by nature such that the cookie doesn't taste "lao hong" when covered with royal icing that would soften cookies that are crisp by nature, although in terms of looks they are not as pretty as regular sugar cookies. I have a request for brown sugar cookies for Teacher's Day so I decided to ride on the request and made some for my kids' teachers too. 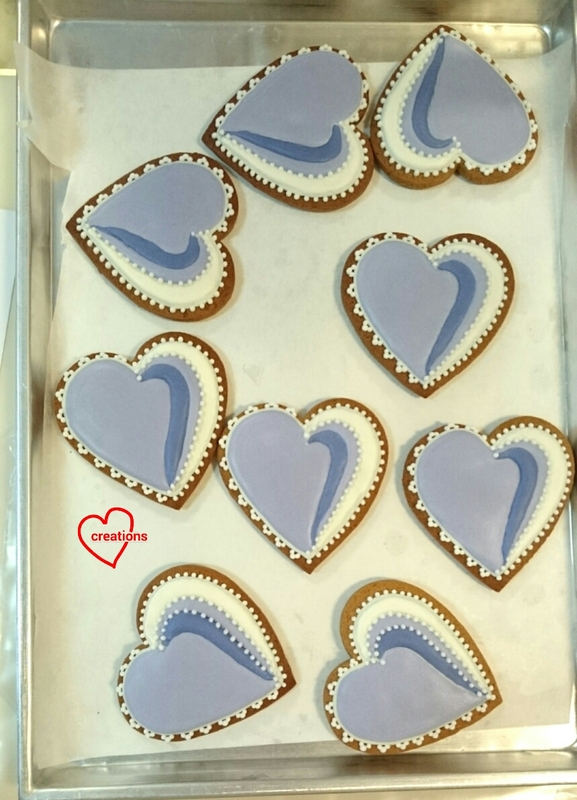 Sharing my first humble attempt at laced designs on iced brown sugar cookies. 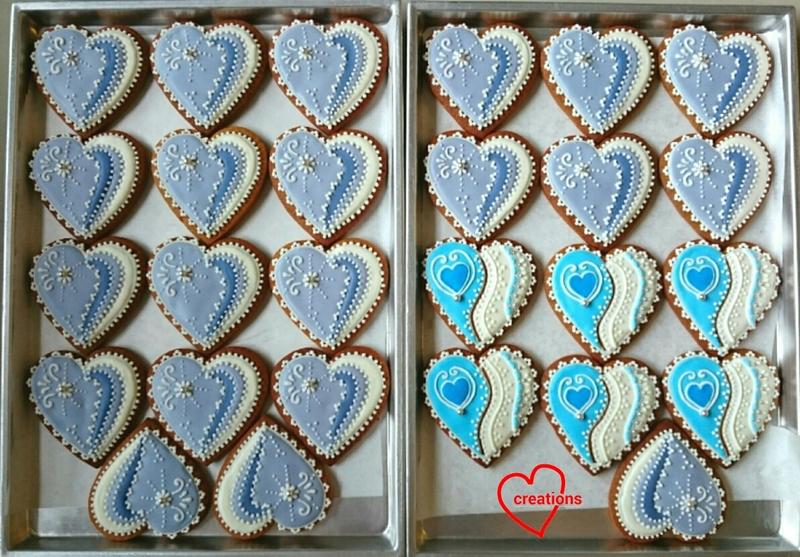 There are more beautiful and intricately designed laced cookies out there that I could use as a reference but I have another whooping 400 iced cookies to make on the heels of this batch of 27 cookies for teachers. I didn't want to kill myself so I tried to look for a design that is elegant and simple. 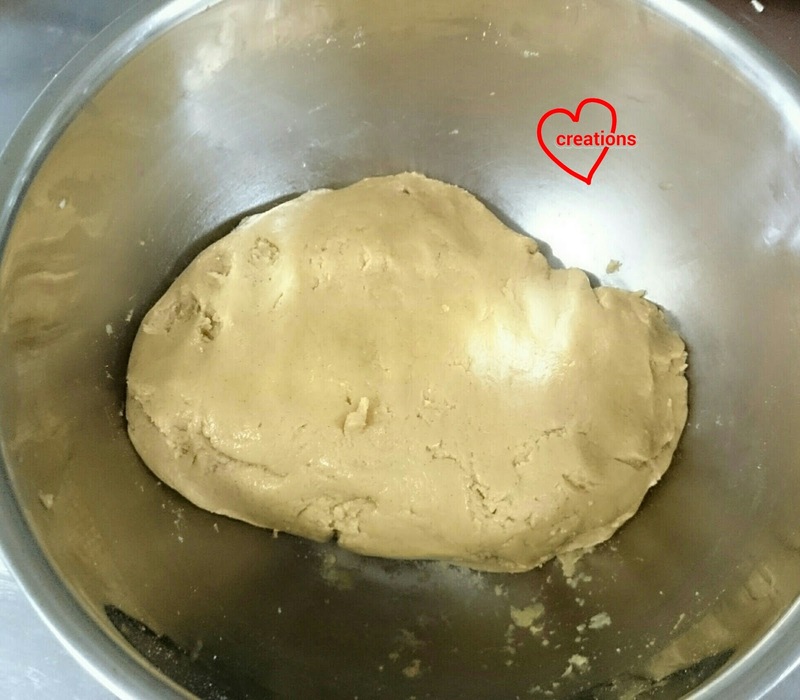 My brown sugar cookie recipe is adapted from a gingerbread cookie recipe, minus the spices and using primarily brown sugar or a mixture of brown and white sugar as the sugar in the recipe. The golden syrup and caramelizing process of the sugar during baking, combined with good quality vanilla bean paste and good brand of butter is the secret to making these cookies smell so awesome. 1. In a large mixing bowl, sift together flour, baking soda and salt. 2. Add cubed pieces of cold butter and rub in with fingertips until the mixture resembles fine breadcrumbs. 3. Add in brown sugar into the mixture and mix well with fingertips. 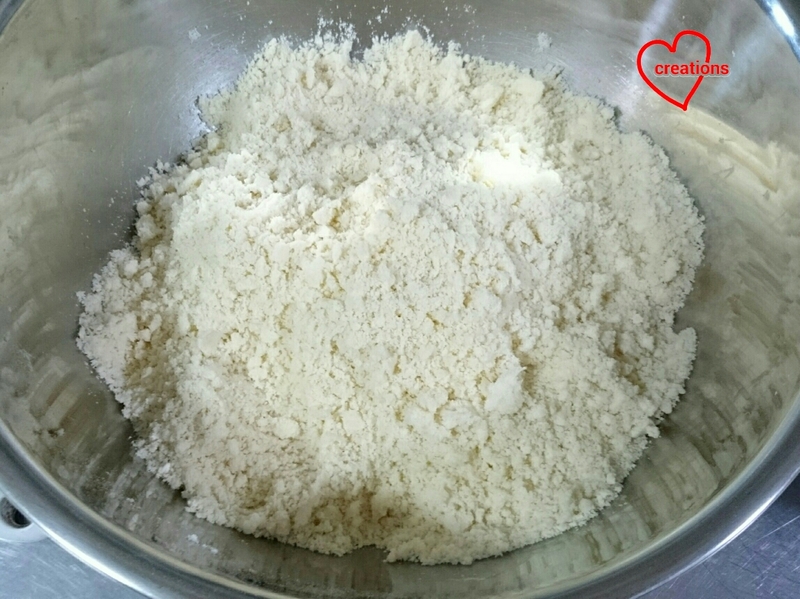 Remove any hard lumps of sugar before adding into the flour mix. 4. Lightly beat egg in a bowl, add golden syrup and vanilla. Mix until well combined. 5. Add egg mixture to the flour mixture. Use a spatula to mix well until a ball of dough forms. 6. Divide dough into 3 portions (optional but I find it easier to work with smaller portions of dough when rolling and cutting). Place each portion between two baking sheets and roll to thickness of 5-6mm. 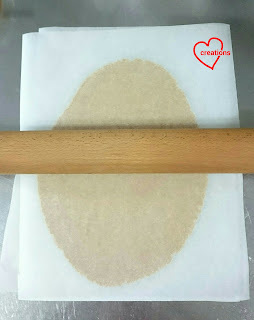 If you are making cookiepops, roll to thickness of 3-4mm. Freeze the dough until firm. You may store the cookie dough in jumbo ziplock bags for a few months in the freezer. 7. Line baking tray/ cookie sheet with baking paper. 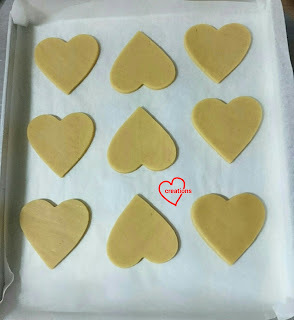 Take out firm dough from freezer and let it sit at room temperature for a minute or two before cutting out the hearts. 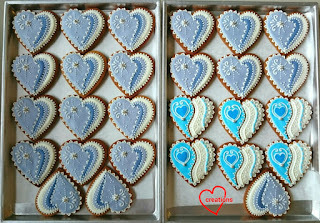 If you are making cookies without a cookie cutter, please refer to this post on how to make your own cookie templates. Place the cookie cut-outs spaced about 2cm apart. Note: If you are using a knife to cut out the cookies with complex shapes, you may find it helpful to place the sheet of cookie dough on reusable freezer packs to prevent the cookie dough from softening too fast. This dough tends to be sticky when soft so try to handle it while it is still firm but pliable. Pop the dough back in the fridge or freezer if it becomes too soft to work with. 8. Chill the whole tray of cookie cut-outs while preheating the oven to 160-170°C with oven rack in the middle. Bake for 15-18 minutes, rotating the baking tray halfway through baking. Note: Use your eyes and firmness of slightly cooled cookies to gauge doneness instead of baking time as size and thickness of cookie cut-outs vary. I tend to overbake slightly to compensate for some softening of the cookies due to royal icing. 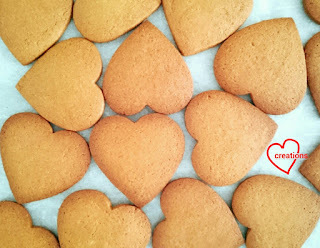 Baked cookies should be browned and firm when cooled. If the cookie still feels soft in the center, pop it back into the oven and bake for another 3-5 minutes and check again. It's ok to pop the tray of cookies in and out of the oven a few times. Cool the cookies completely on tray or cooling rack before storing or icing. You may stack the cookies between baking sheets in a box for storage. Make sure that the storage container is airtight. Store in a cool and dry place. For best results, let the baked cookies rest for at least a day before icing. 1. Sift together icing sugar, meringue powder and salt in a clean, grease-free metal mixing bowl. Add water and flavourings. 2. 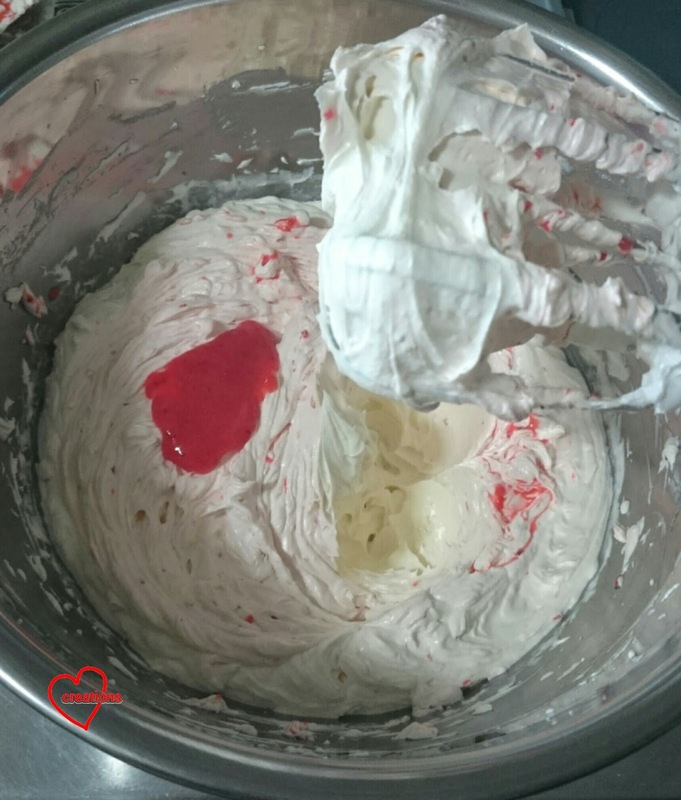 Use electric mixer on low speed or hand whisk to whisk for about 7 minutes. Using hand whisk will require a lot of muscle strength for this quantity of ingredients so I used my stand mixer. Hand whisk is more suitable if your half the recipe. If using stand mixer, scrape down the sides every1-2 minutes. Beating on high speed with electric mixer is not recommended as it will introduce a lot of air bubbles. Note that the icing will change from off-white to white in colour as it becomes ready for use. Note: The resulting consistency of this icing is close to flooding consistency whereby any peaks will disappear within 10-20 seconds. 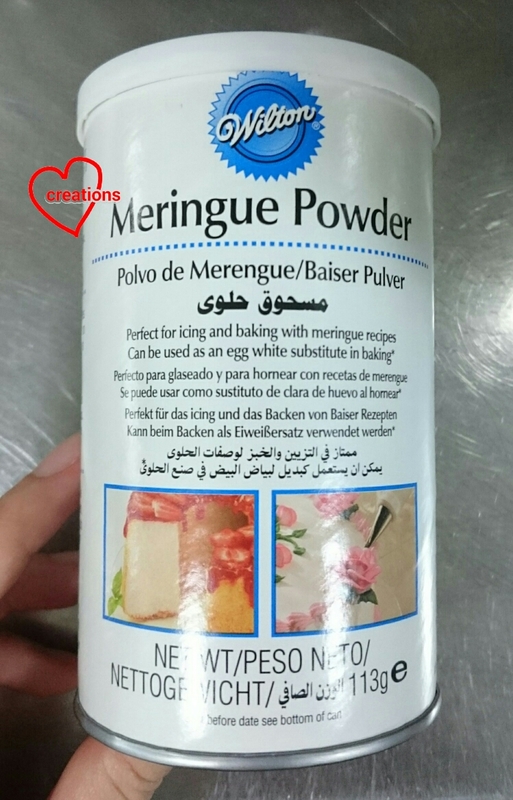 Add more icing sugar if you want a stiffer consistency and more water if you want it to be runnier. Always add water a bit at a time to prevent it from becoming too watery. Remember to mix well. Add colour to the icing with gel food colouring as you wish. I like to use charcoal powder for black and some cocoa powder for brown as I prefer natural sources of colouring. Store any unused icing in airtight container with cling wrap touching the surface. You may refrigerate the icing for a month. Stir well before use. 1. Arm yourself with a damp paper towel to wipe off any mistakes before icing hardens. 2. Use a toothpick to ease the icing into small corners or for drawing very fine features. 3. You may oven dry at 60°C using the fan mode to speed things up but be careful not to leave it in the oven too long as the oil from the cookie base will seep into the icing and make it look patchy. Alternatively, turn on the heat for several seconds before turning it off, with the fan mode on. It may take longer to dry but chances of the oil seeping from cookie base to icing layer is less. 4. Store the cookies in airtight container only when completely dry. 5. You may use piping bags fitted with piping tips or a squeeze bottle but I find that a lot of icing is wasted. I just cut a small hole in ziplock bags or piping bags. I only use piping tips if I need very neat outlines. 6. Use wet-on-wet icing technique (adding icing on top of wet icing) if you want the features to be flat. Wait for the bottom layer of icing to dry if you want the feature to stick out. 7. Practice makes perfect! I am still practising and learning :). Mastering the right consistency for icing takes time. I packed the cookies in self-seal bags with satin ribbons tied at one end. Blessed Teacher's Day to all teachers! Happy birthday to my dearest mummy, who's always been there for me! 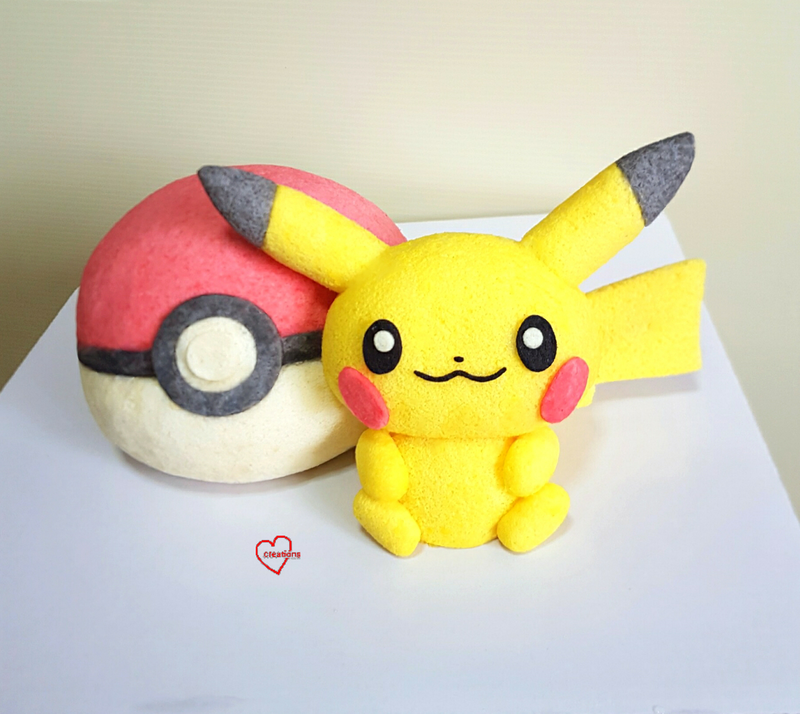 I made this 6-inch big Pokeball and Pikachu (from Pokemon go) using natural coloring from soft chiffon cake for her! 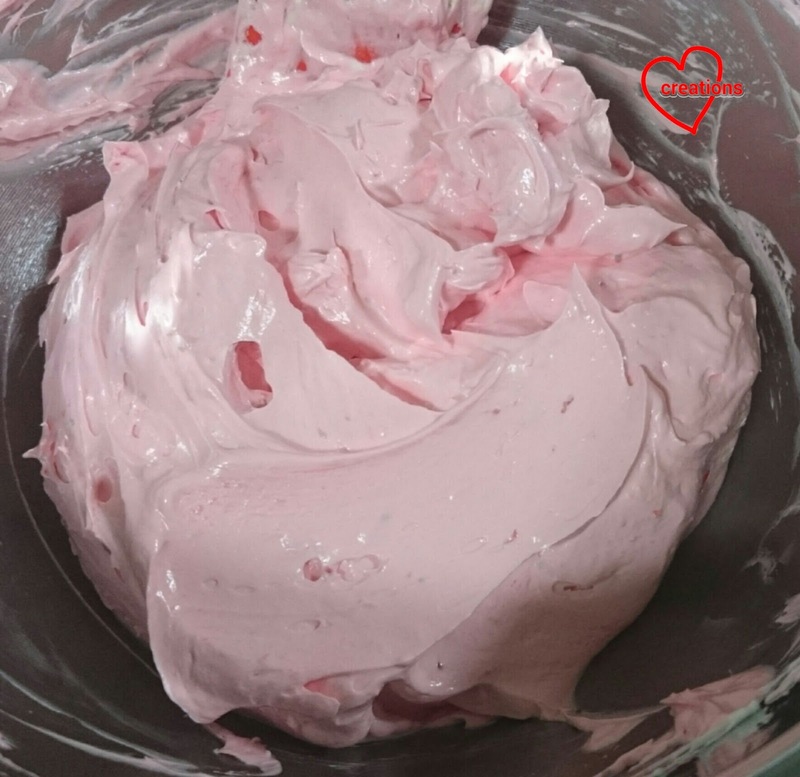 She loves the Raspberry jello-milk chiffon cake that I used for my National day chiffon cake, so the Pokeball uses the same recipe. I baked a reduced egg yolk milk chiffon recipe on one side of a ball cake pan, and raspberry jello chiffon cake, topper with a 1-cm layer of charcoal chiffon batter on the other side. I used a few drops of natural red coloring from PME to darken the shade. I cut out the pokeball circles in front from leftover batter baked as sheet cakes. For the Pikachu, I baked a lemon chiffon cake, using yellow extract from gardenia yellow for the colours, in 2 bowls (for the face and body), 4 cake pops (for limbs), swissrolls (for ears) and sheet cake (for tail). 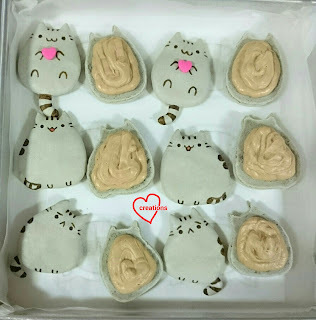 The tip of the ears were from charcoal chiffon cake swissrolls. Made with lots of love! For those who have pre-ordered, you can collect from 9 Sept to 10 Sept, and those who opted for delivery will have theirs sent on 9 Sept! 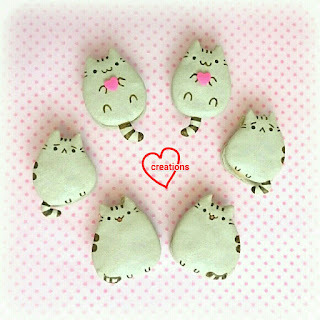 Hope you enjoy these loving creations!! I'm so excited! This is the second time I am making Pusheen macarons. Checkout my first attempt here. I used the reduced sugar recipe for macaron shells and chose whipped Earl grey white chocolate as the filling. If you don't have a sweet tooth, tea flavoured or dark chocolate flavoured fillings are best to pair with macaron shells that are sweet. 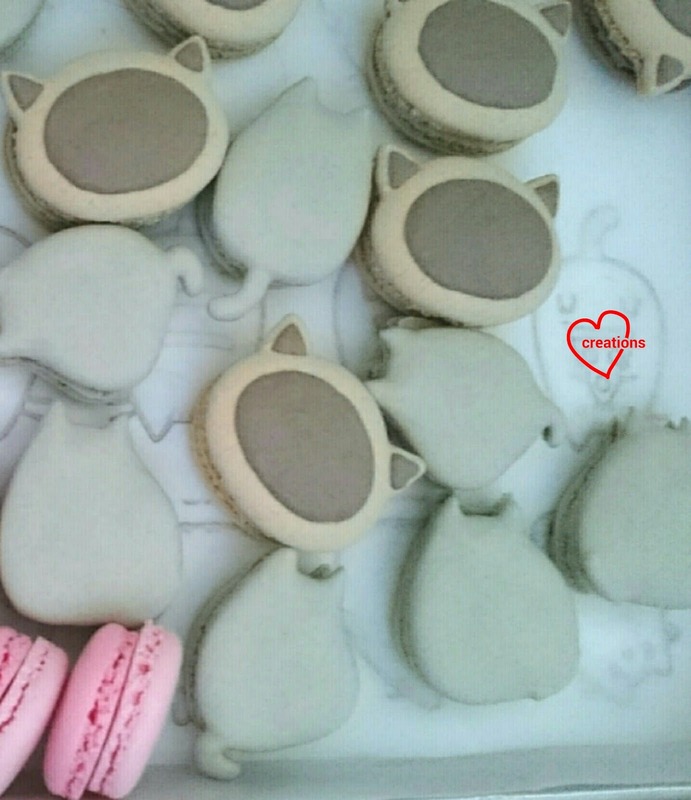 I actually made these cuties along with some Siamese cat macarons and a pink macaron carousel structure. 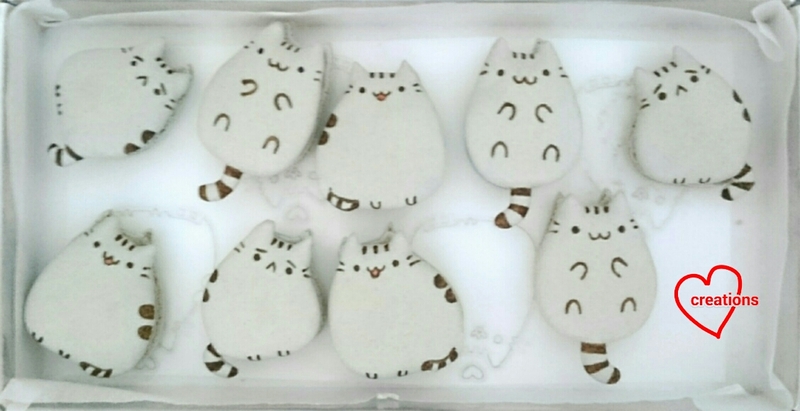 But for your convenience, I will type out the full recipe for these cuties. 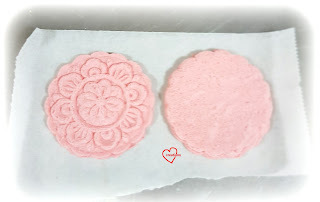 You may refer to this post for a detailed write-up about the reduced sugar macaron shell recipe, my Creative Baking: Macarons book for a systematic approach of presenting the basics to fancy shaped macarons, this post for video tutorials of macaron basics and this post for video tutorials of piping complex shaped objects. 1. 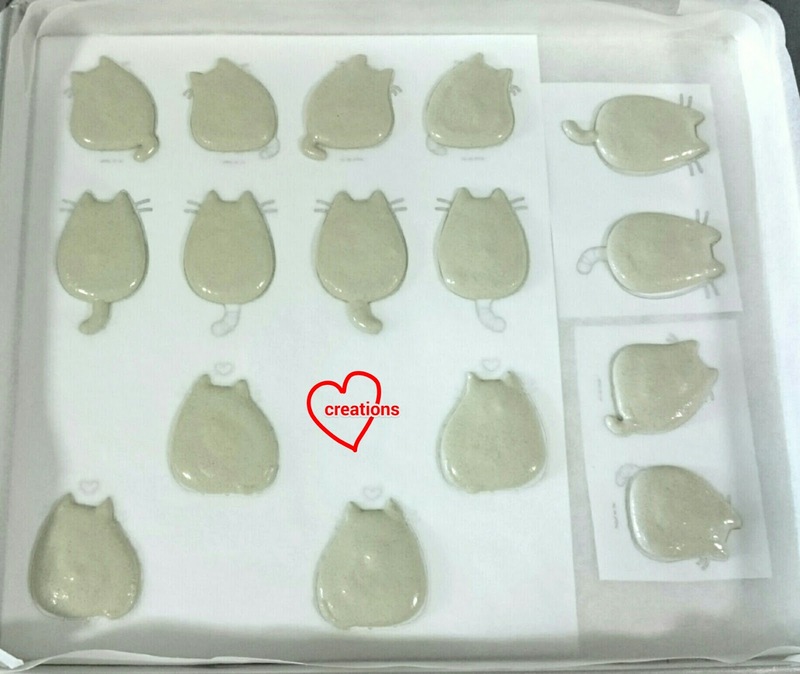 Prepare baking trays with Pusheen template and baking sheet over it. Stick the baking sheet to the tray with Italian meringue after you have made it. 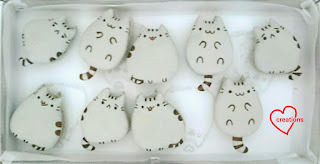 You may find pictures of Pusheen easily and since it is a trademarked character I will not reproduce the template here. 2. Make the mass. 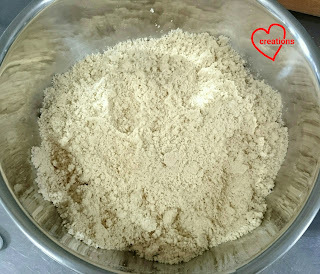 Sift together almond, icing sugar, rice flour, cornflour, salt and charcoal powder in a large mixing bowl. Add egg whites and mix well until a thick paste forms. Add a drop of orange food colouring to make the grey shade warmer but this is optional. 3. Prepare Italian meringue. Heat caster sugar and water in a small saucepan until it reaches 115°C without stirring. Use a candy thermometer to monitor the temperature. In the meantime, beat egg whites with cream of tartar with electric mixer at medium low speed until soft peaks form. Be careful not to overbeat till stiff peak but also do not underbeat such that the egg whites are foamy but unable to hold a peak for 1 second. Reduce mixer speed to keep egg whites moving if temperature of syrup is not reached yet. 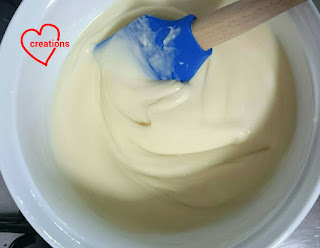 Once syrup is ready, increase mixer speed to medium high, carefully pour the syrup into the egg whites in a slow, thin stream while avoiding the beaters. Continue beating for another 10-15 minutes until the meringue is cooled to about body temperature. The meringue should be stiff and glossy. Reserve about 2 tbs of meringue for sticking the baking sheet onto the trays. 4. Fold the meringue into the mass in 2 batches (with the first batch about a third of the meringue) with a spatula until the batter moves in a slow-moving lava-like manner. 5. Transfer batter into piping bags fitted with round piping tips of appropriate sizes (depends on your template). I used Wilton #10 and #5 tips for the large and small portions. Use a toothpick to pull the batter whenever necessary. Bang the tray on the table to release trapped air bubbles. 6. Let the piped shells dry in an air-conditioned room and/or under the fan until the surface is no longer sticky to touch. About 2 hours. 7. Bake in preheated oven with rack at lowest or second lowest position at 140°C for 12 minutes, rotate the tray and bake at 125°C for another 5-10 minutes or until the feet of the shells do no appear wet. Baking times may vary according to size of shells. Let the shells cool completely before peeling the baking sheet away from the shells. Freshly baked shells! Along with some Siamese cats and a little peek of the pink carousel shells. Decorating with brown edible marker. 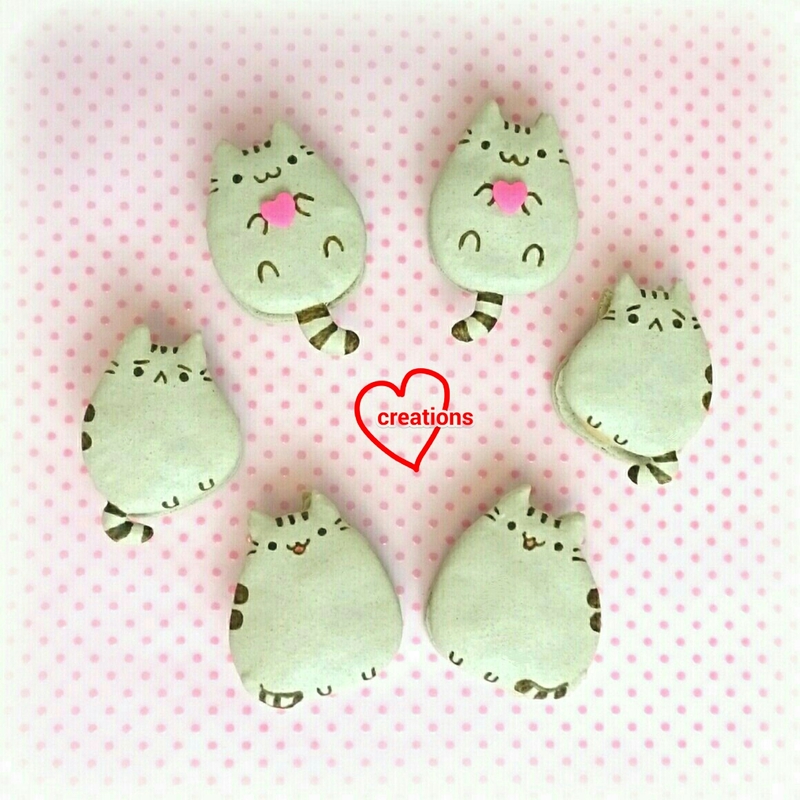 I decided to stick on some heart sprinkles for one of the Pusheen designs with royal icing or melted chocolate. Filling up the shells with whipped Earl grey white chocolate filling! I made this sweet Chocolate chiffon Hedgehog on top of a Rainbow Chiffon garden for my friend's sister who loves cute hedgehogs! 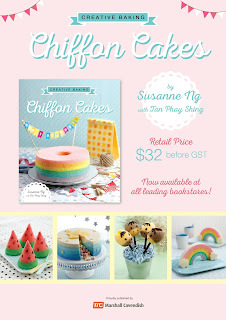 I haven't posted my Rainbow Chiffon Cake for awhile =) It's now on the cover of Creative baking: Chiffon Cakes and I'm very thankful many have tried the recipe in the book and given great reviews! 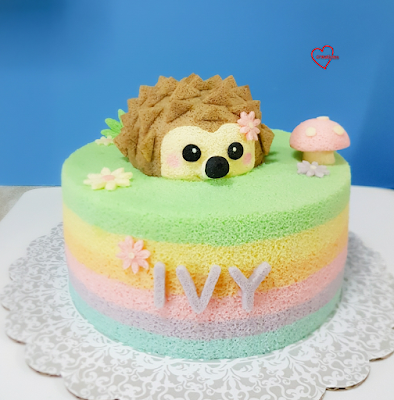 The recipe for the Chocolate-vanilla Chiffon Hedgehog has been shared previously here. Instead of piping the eyes, here I stuck on cake cut-outs using melted marshmallows. Preorders for my 2nd chiffon cookbook, Deco Chiffon Cakes is finally open for 1 week at a special preorder price (details in poster below)! The preorder form and more details can be found here. In addition to step-by-step pics for 30 recipes which include salted egg yolk chiffon lava and moo moo, it has taken into feedback/queries from the previous book and boasts a special extended 6-page troubleshooting guide for creative chiffons as well as free basic recipe. Thank God our PM is fine!! This 'Butterflies' Blue Ombre Tier Chiffon Cake is made for my friend's tea party. She was so inspired by Joseph Schooling's amazing Gold at the 100m Men's Butterfly race in the Olympics Rio 2016, that she asked me to design her cake to commemorate the event. 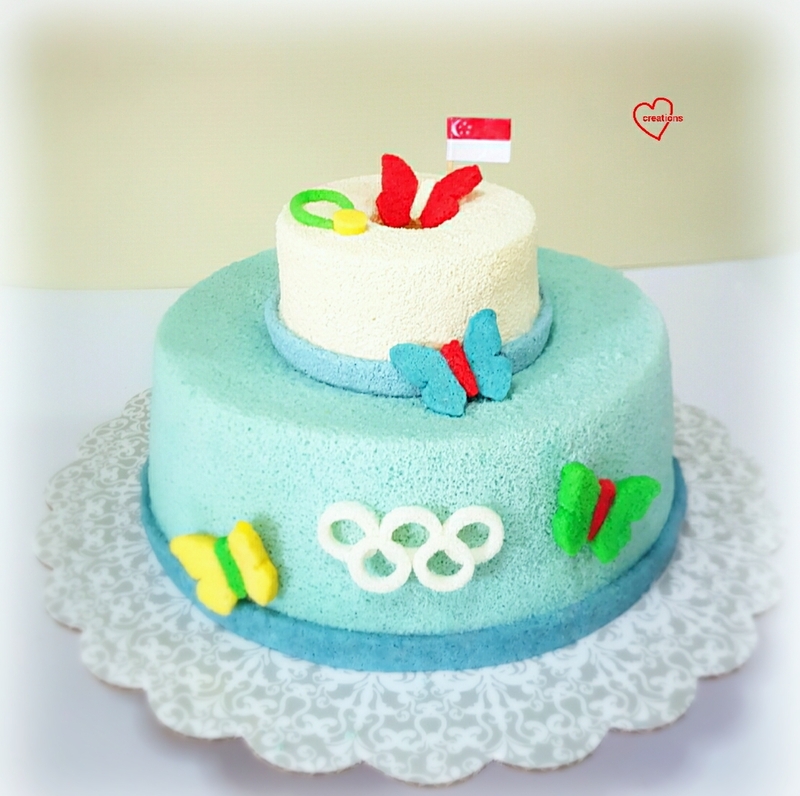 I was inspired after watching the 100m Butterfly to make a cake to capture the race. The butterflies are dressed in their country's colours/jerseys, and the red-white butterfly on top is none other than our champion Joseph Schooling with a little medal at the side and a mini flag behind! The 3 butterflies below are the silver medallists (can you guess which is Michael Phelps ;))? When Schooling grabbed the Gold, the nation rejoiced with him. Thousands of kids were inspired by him. 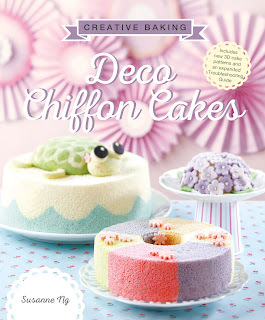 The recipe for a similar mini Rainbow Tier Chiffon Cake is in Pg 74 of Creative baking: Chiffon Cakes. Here I made an Ombre version, using blue pea flowers. Hope that they will enjoy the meaningful creation! Meanwhile, he has really touched our hearts and is an inspiration to our children. 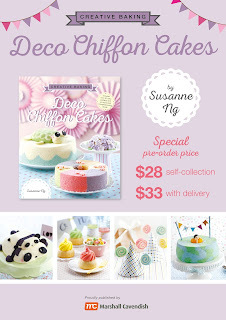 Preorders for Creative baking: Deco Chiffon Cakes will be open for another week at a special discounted price of $28 for self-collection, $33 for with delivery (bookstores $34.24 after gst). It contains and extensive 6-page troubleshooting guide, and step-by-step pics of new 3D patterns. You can find the form here. Do hop on to the book link for more info! 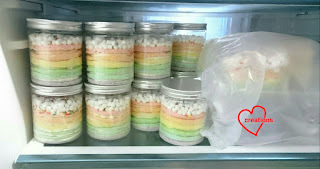 This is my first attempt at making rainbow cake in a jar and push pops! I would not have attempted these if I was not approached by Fairy Floss Official to make the cakes. The cakes are alternating layers of vanilla chiffon sponge with a hint of lemon and whipped vanilla lemon white chocolate ganache, topped with marshmellows and rainbow sprinkles. It took me longer than expected for this batch of 20 cake in jars and 10 push pops as it's my first attempt. I used a reduced egg yolk recipe so that the pink, blue and purple colours can appear pastel and sweet without adding too much colouring. Some butter is used in replacement of canola (or any vegetable) oil to add some richness to the cake while retaining the lightness. Although vanilla flavour was requested, I decided to add a tinge of lemon flavour to give the cake a more refreshing touch. 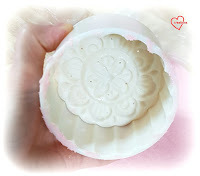 I used Taylor & College's natural lemon extract paste. 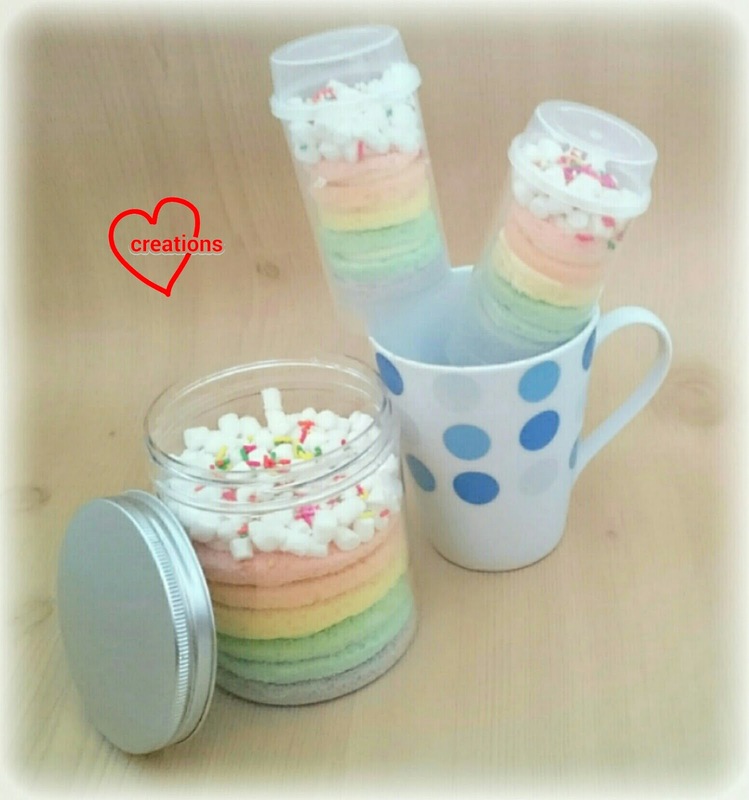 Recipe below is for 20 8x12 cm jars and 10 2.5x7cm push pops. 1. Prepare a tray of water as base of oven (optional but it's to provide steam while baking). Preheat oven to 150°C. Set oven rack to second lowest position. Line a 25x30cm tray and a 15x15cm tray with baking paper. 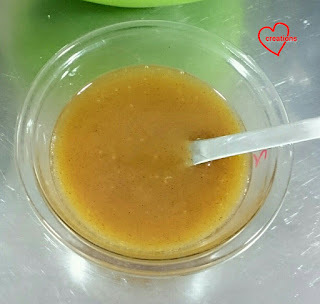 Combine melted butter and vegetable oil in a bowl. Combine milk, vanilla extract and lemon paste in another bowl. 2. Prepare egg yolk batter. Use a hand whisk or hand held electric mixer to beat egg yolks and sugar until pale and thick. Add oil and melted butter and beat until well combined. 3. Add a third of milk and whisk well. 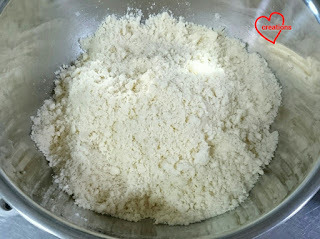 Add a third of sifted flour and salt and whisk until no trace of flour is seen. Repeat until all milk and flour are added. 4. Divide egg yolk batter into six portions. Colour each portion with a chopstick dip of gel food colouring. 5. Prepare the meringue. Do this one at a time for all six colours, unless you have many ovens and are able to bake more colours for each round of baking. In a clean metal bowl, beat egg whites with cream of tartar with an electric mixer, gradually adding sugar, until firm peaks form. 6. Quickly but gently fold the meringue into egg yolk batter in three additions with a spatula. You may want to pour the egg yolk batter into the meringue for the remaining last one-third to minimize the number of times you need to fold. Pour the batter into the prepared baking trays. Tap the trays to release air bubbles. 7. Bake for 15-17 minutes or until skewer comes out clean. Immediately remove from tray and cool with another baking sheet over. 8. 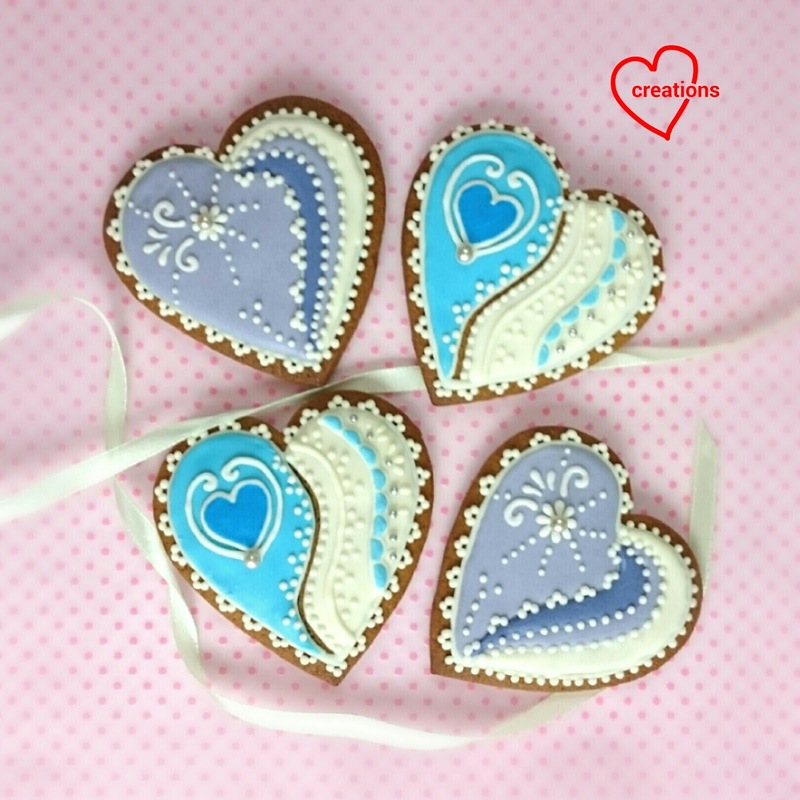 Use round cookie cutters to cut out cakes from the various colours. Choose the size that is suitable. For my case it's 2.5cm and 8cm diameter round cutters. Use a serrated knife to halve each circle cut-out as the layer cake is quite thick. The cakes needed to be on display for the whole day outdoors in warm Singapore so the frosting has to be able to withstand this kind of weather. My first choice would have been dairy cream, followed by swiss meringue buttercream in terms of taste but both are not suitable in Singapore's weather. I opted for whipped white chocolate ganache as the frosting base instead but included butter and shortening to reduce the amount of white chocolate used to reduce the overall sweetness while giving the frosting the stability needed in this weather. 1. 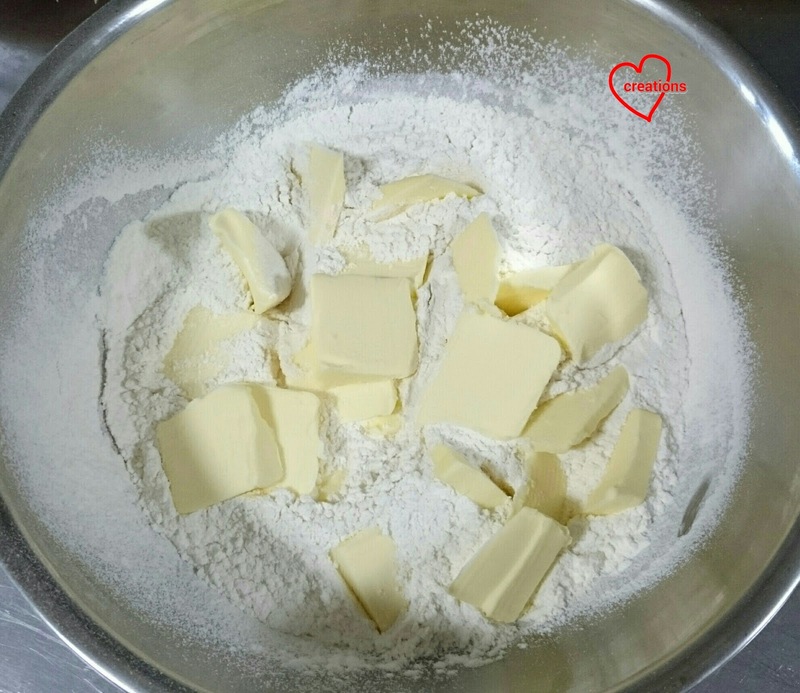 In a large microwave-safe bowl, place white chocolate, unsalted butter and shortening. Heat at medium power for 20 seconds and stir well. Repeat until everything is smooth and melted. 2. In a saucepan, heat heavy cream until it starts to bubble. Remove from heat and pour over melted chocolate. 3. Stir with a spatula in one direction until smooth and well combined. 4. Add vanilla, lemon extract and salt. Stir until well combined. Chill in the fridge for 10-12 minutes. 5. 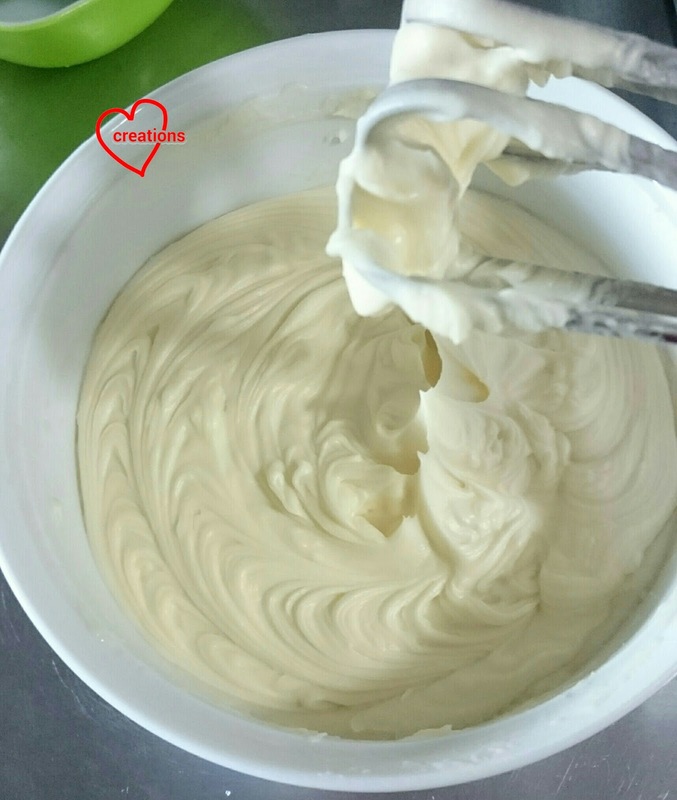 Use an electric mixer to whip the white chocolate ganache at low speed for a minute. 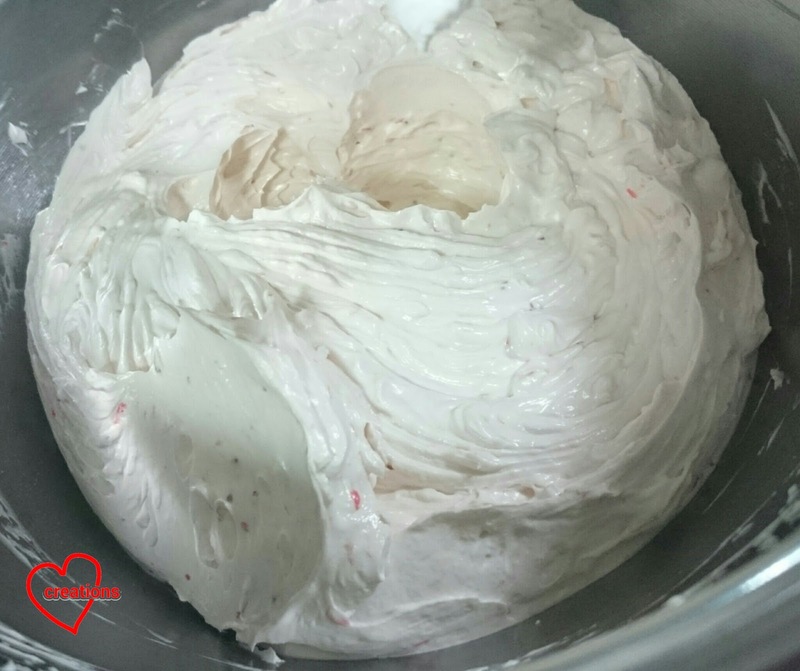 Return the mixture into the fridge for a few minutes and whip with electric mixer until pale, light and fluffy. Whipped vanilla lemon white chocolate ganache! To assemble, place alternating layers of cake and pipe whipped ganache. Top it off with a bit of ganache, marshmellows and rainbow sprinkles. Refrigerate until ready to display. The push pop containers are not airtight so I kept the whole lot in a sealed plastic bag. Here's a peek at my fridge!